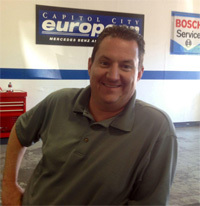 I started Capitol City European in the fall of 2001 with goal surrounding myself with employees that have the same passion for european cars that I do. The business has grown steadily and I have been able to find employees that are very good at what they do and most importantly to me they like what they do. I have fifteen years experience working on Mercedes Benz and BMW vehicles. My hobbies include almost anything that is motorized, in the past I have raced, ridden and driven off road motorcycles and a couple of race cars.